Happy New Year to everyone from Budget Blinds of Southwest Colorado Springs and Pueblo. If you’re like us, you may have already broken a few of the New Year’s resolutions you made a few weeks ago. But that doesn’t mean you shouldn’t lose sight of your 2017 goals! According to Harvard University’s Joint Center for Housing Studies more Americans than ever before are going to renovate their homes. 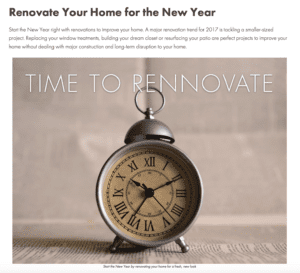 The forecast is that home renovation will go up 8.6%! We can also refer you to our sister companies for concrete treatments and storage upgrade solutions! Read the full article here.